Downloadable past issues of my newsletter. INTRODUCING... HILARY'S BLEND JUST ADD MEAT™ - turn any meat into a complete & balanced meal! HILARY'S BLEND JUST ADD MEAT™ vitamin/mineral whole food supplement can be added to cooked or raw meat to make a complete and balanced (AAFCO) meal. Pick from a list of meats on the label and prepare according to packaging instructions. For more information on HILARY'S BLEND JUST ADD MEAT™ products, please click here. Beginning in 2018 (we've had more delays), owners and veterinarians will be able to formulate their own home-made recipes using Hilary's Blend Recipe Builder online formulation software which will be launching at www.hilarysblend.ca.Veterinary clinic registration is now open (get a 2 year medical subscription for free for Canadian clinics registering before the website officially opens). Owners will be able to use the site for free to formulate home-made recipes for healthy pets. Owners can now fill in a form to receive notification when the site officially opens. All recipes formulated on this site will be properly balanced using Hilary's Blend vitamin/mineral supplement. In Canada, my cookbook and supplement are sold through veterinary clinics. 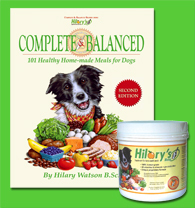 Any veterinarian in Canada can order my products for owners - many clinics are already stocking both the cookbook and HILARY'S BLEND supplement. Ordering from your veterinarian saves you the shipping charges and gets your order to you faster. For more information on ordering in Canada, please click here. I am not currently selling outside Canada, nor do I currently sell my products online. You want your dog's food to be safe enough for a baby, because you love your dog like a child. You are a busy person but you're willing to cook for your dog because you want to choose each ingredient and know exactly what your dog is eating. Human dietetians have university degrees. You want your dog's recipes formulated by a qualified pet nutritionist with a university degree in pet nutrition. 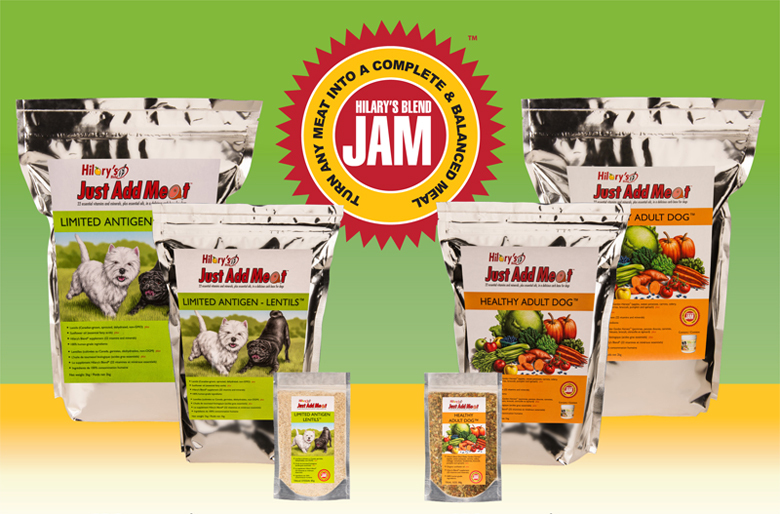 You probably haven't read the National Research Council's Nutrient Requirements of Dogs and Cats or the Association of American Feed Control Official's AAFCO Dog Food Nutrient Profiles but you value science and you want your dog's food to deliver 100% complete and balanced nutrition as defined by these internationally-recognized standards. 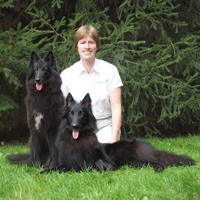 I'm Hilary Watson and I've been a pet nutritionist for more than 20 years. The 101 recipes in my cookbook deliver 100% complete and balanced nutrition as defined by AAFCO. Each of my recipes is balanced with HILARY'S BLEND supplement, the first and only pre-biotic vitamin mineral supplement specifically designed to balance home-made recipes. The first ingredient in my supplement is chicory root extract, a natural fibre that stimulates healthy bacteria in the gut, improving digestion and reducing intestinal toxins. HILARY'S BLEND supplement contains 22 essential vitamins and minerals at levels that complement those naturally found in fresh fruits, vegetables and meats. My recipes are fast and easy to prepare. They can be made in batches and frozen. My recipes offer 100% complete and balanced nutrition. They are proven favorites with even the pickiest of eaters. They have helped dogs with allergies, skin and coat problems, sensitive digestive systems as well as diseases such as kidney disease, cardiac disease, gastroenteritis, pancreatic disease and other medical conditions (read owner testimonials). If you want the nutritious goodness of fresh human foods combined with the scientific rigor of complete and balanced nutrition, my cookbook and supplement are for you. Your dog will thank you at every meal! 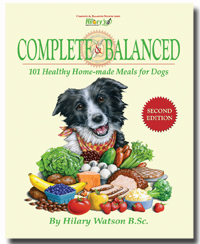 Using food formulation software, pet nutritionist Hilary Watson has created 101 recipes that offer 100% complete & balanced nutrition, as defined by the Association of American Feed Control Officials (AAFCO). This book includes adult, puppy, and senior recipes as well as low calorie, low protein, limited antigen, low fat, low oxalate, and vegetarian recipes. Included with each recipe is a full 43-nutrient profile as well as calorie content and feeding guides. 100% human grade supplement, containing ingredients similar to those in name-brand human multi-vitamins. Specifically designed to balance the recipes in Complete & Balanced: 101 Healthy Home-made Meals for Dogs, Contains 22 essential vitamins and minerals, plus chicory root extract, a pre-biotic fiber for intestinal health. No additives, no fillers, no preservatives. Hypoallergenic, bioavailable ingredients. Highly concentrated (350 g lasts a 40lb dog about a month). WHAT IS COMPLETE & BALANCED NUTRITION? Are you a dog club interested in raising funds for your organization by hosting a dog nutrition seminar? For more information, please send me an email. Raw versus cooked? - my personal opinion. Read what happened to this puppy when he was fed an unbalanced diet of raw beef and an organic veggie premix(abstract from the Journal of the American Veterinary Medical Association). Are meats interchangeable in a recipe? No, No, NO!!! How many calories does your dog need? How much should you feed? Use my calorie calculator to find out. I am no longer offering a custom recipe service.